Alan Turing was an English mathematician and scientist who is widely considered to be the founder of the computer science discipline. The Turing machine, an abstract concept detailing many of the foundational ideas in computer science, is one of the most important milestones in the history of computing. Turing was born in London on June 23rd of 1912 and was educated at Sherborne School in 1926. Turing had discovered the work of Einstein at Sherborne and greatly excelled in mathematics. He studied mathematics at King's College at Cambridge where he graduated with first-class honors in 1934, and was elected a fellow in 1935 for his dissertation proving the central limit theorem. First described in 1936, the Turing machine was a theoretical device that was meant to represent and prove the mathematical possibility of mechanical computation. The abstract machine describes many of the components of the modern computer, including the concept of using a tape for memory, a head for reading and writing, a table which describes algorithms for moving the head and reading/writing, and a state register, which stores the state of the machine. Turing also described a Universal Turing Machine, of which he stated that it is possible to invent a single machine which can be used to compute any computable sequence. This is achieved by having a standard description of the machine to appear at the beginning of a machine's tape, and its functions can then be emulated by the machine reading this description. Turing's work in these areas would later be explored by prominent figures such as John von Neumann and Claude Shannon, and its implications are still studied today. Between September of 1936 and 1938, Turing worked under Alonzo Church at the Institute for Advanced Study in Princeton, New Jersey, and earned his Ph.D from Princeton in 1938 for his dissertation "Systems of Logic Based on Ordinals", which introduces the concepts of ordinal logic and relative computing. During World War II, Turing was employed at Bletchley Park working on decoding German ciphers. He developed a bombe, cryptoanalytic machine which would decode the German Enigma codes. Following a stint a Bell Labs between 1942 and 1943, Turing pursued work on electronic enciphering of speech in the telephone system at Hanslope Park. 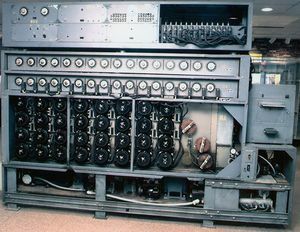 After the war, Turing worked on the design of the ACE Computer at the National Physical Laboratory, and his paper on the machine, presented on February 19th of 1946, was the first design describing a detailed stored-program computer. In 1949, Turing worked on the Manchester Mark 1, one of the first functional stored-program computers. 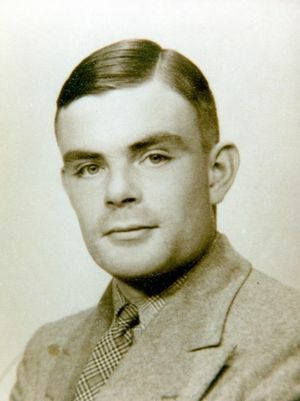 Homosexuality was still illegal in the United Kingdom in the 1950s, and in 1952 after inadvertently mentioning to police that he was in a homosexual relationship after a reporting a break-in, Turing was charged for gross indecency, and was given a choice between imprisonment and chemical castration of which Turing chose the later. His conviction resulted in the removal of his security clearances and prevented him from working on further cryptography consulting projects. Turing's work over the next two years shifted to problems in mathematical biology. On June 8th, 1954, Turing's cleaner found him dead of an apparent suicide by cyanide poisoning. 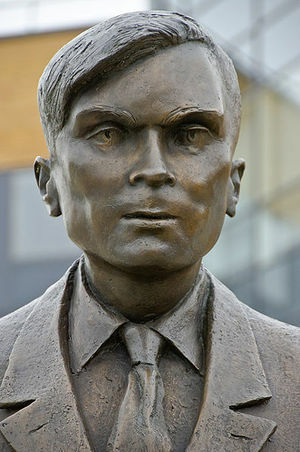 Turing was honored by the Association for Computer Machinery's Turing Award, the highest prize in the field of computer science, and a statue of him was erected at the University of Surrey on the 50th anniversary of his death. The Alan Turing Year- The English-based site and clearing house for all things Turing around the world, as a "Centenary Celebration of the Life and Work of Alan Turing"
This page was last edited on 13 January 2016, at 16:18.